Price your leather jacket right. When it’s time to clean out the closets, a yard sale is a profitable way to send off your gently used but still valuable items. In regards to pricing merchandise, the general yard sale rule of thumb is to mark items at one-third of the original price or lower. However, your gently worn leather jacket requires special considerations and therefore special pricing. Inspect the inner lining of your jacket to ensure it is still of excellent quality. Check for tears and snags, and whether the seams are intact. Look for frayed or unraveling thread, which you may be able to repair before the sale. If your jacket is gently worn but not damaged, then you can classify it as excellent in condition. 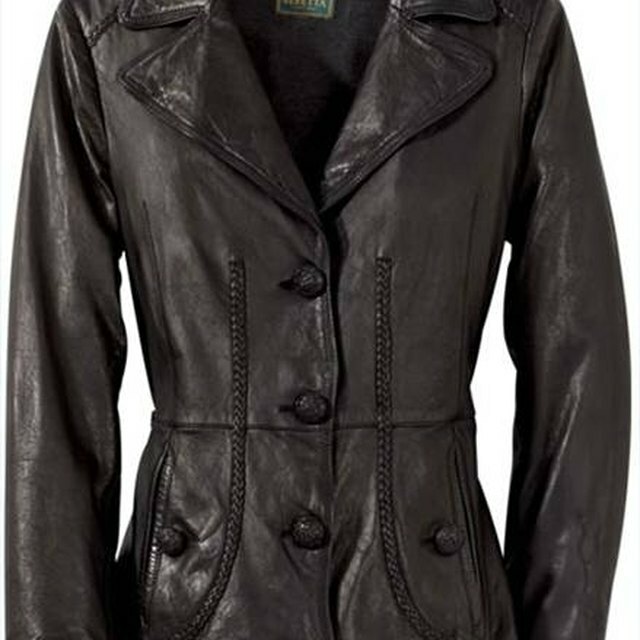 If your leather jacket is a classic style, it will increase buyer desire, as well as the value of your garment. Classic styles include motorcycle jackets, trench coats, blazers, and shearlings. Zippers are a mainstay of classic styles; you must ensure that zippers are functioning properly. Button closures should fit properly, and missing buttons should be replaced. Compare prices with consignment shops and thrift stores in your neighborhood. If your leather jacket is in excellent condition, consignment shop prices will give you a base price for your garage sale. If your jacket is worn out, damaged, or an unfashionable style, then thrift store prices can help you decide how to price your jacket. If you believe your leather jacket is a classic style and in good to excellent condition, then pricing can begin at half of the original purchase price. If you have a jacket in good condition, consider selling it for one-third the original price. Items in poor condition will sell for much less than the original purchase price. Once you have decided on the price, tag your item, hang it where passersby can easily see it from the road, and prepare to enjoy a day of garage sale fun. Hang your leather jacket next to matching clothing items, to create a fashionable look. Avoid adhesive price tags that will leave a residue on the leather. String tags are best when looped through a button hole or safety pinned to the manufacturer's tag. Be prepared to haggle. Be prepared to lower prices throughout the day. From Southern California, Kristie Camacho has been writing reviews, criticism and instructional articles since 2005. Her work has appeared in online magazines as well as in publications such as "The Poetry of Walt Whitman: New Critical Perspectives." Camacho holds a Master of Arts in English from National University, La Jolla and a Bachelor of Arts in literature from California State University.